Fearing for his life, Joseph Smith fled Kirtland, Ohio, in January 1838 and traveled hundreds of miles to Far West, Missouri. Over the next year and a half, he sought to establish Far West as a city of Zion with a temple, was involved in armed conflict between the Latter-day Saints and other Missourians, was arrested and imprisoned, escaped custody and fled to Illinois, and helped establish new settlements in Illinois and Iowa Territory for the Saints. These events are covered in this sixth volume of the Documents series of The Joseph Smith Papers. After arriving in Missouri in early 1838, Joseph Smith resettled his family in Far West, where the majority of Missouri Saints lived. During the next several months, he organized new settlements in the nearby towns of Adam-ondi-Ahman and De Witt in preparation for the Saints who were emigrating from Ohio and elsewhere. Smith's efforts to establish the Saints in northwestern Missouri are manifest in revelations, minutes of meetings, and other documents included in this volume. Brenden W. Rensink is an Assistant Professor of History, Assistant Director of the Charles Redd Center for Western Studies at Brigham Young University, and general editor of Intermountain Histories. Before joining the faculty at BYU he earned a Ph.D. from the University of Nebraska – Lincoln, was visiting faculty at the University of Nebraska at Kearney, and a historian and editor for the Joseph Smith Papers. He is the author of numerous historical articles, anthology chapters, and reviews on North American West, transnational borderlands, indigenous peoples, and comparative genocide studies. He co-authored A Historical Dictionary of the American Frontier (Rowman Littlefield, 2015) and will soon publish his forthcoming monograph Native but Foreign: Transnational Cree, Chippewa and Yaqui Refugees and Immigrants in the U.S-Canadian and U.S.-Mexican Borderlands, 1880-present (Texas A&M Press). Elizabeth Kuehn is a historian for the Church History Department, The Church of Jesus Christ of Latter-day Saints. Mark Ashurst-McGee is a senior research and review editor for the Joseph Smith Papers and a specialist in document analysis and documentary editing methodology. He holds a PhD in history from Arizona State University and has trained at the Institute for the Editing of Historical Documents. He coedited volume one of the Journals series of The Joseph Smith Papers (published 2008) and volume one of the Histories series (2012). He is the author of peer-reviewed articles on Joseph Smith and early Mormon history. This volume covers two of the most exciting years in Church history. Here you can read about the disaffection of Oliver Cowdery as he alleges that Joseph has begun his practice of polygamy in secret. While in Liberty Jail, Joseph wrote to the Saints as they left Missouri and traveled to Nauvoo, expressing some of deepest regrets of losing several friends while at the same time giving profound thanks for those who supported him and stayed by his side. This volume describes Joseph's personal feelings about what it means to have a true friend. “Those who have not been enclosed in the walls of a Prison without cause or provocation can have but little idea how sweet the voice of a friend is, one token of friendship from any source whatever, awakens and calls into action every sympathetic feeling. It brings up in an instant everything that is passed, it seizes the present with a vivacity of lightning, it grasps after the future with the fierceness of a tiger, it retrogrades from one thing to another until finally all enmity malice and hatred and past differences, misunderstandings, and mismanagements are slain victorious at the feet of hope, and when the heart is sufficiently contrite, then the voice of inspiration steals along and whispers, "My Son peace be unto thy soul, thine adversity and thine afflictions shall be but a small moment, and then if thou endure it well, God shall exalt thee on high, thou shalt triumph over all thy foes, thy friends do stand by thee, and they shall hail thee again, with warm hearts and friendly hands"". Very well written and documented. Really enjoyed reading the letters from the Prophet Joseph Smith to his wife while he was in the Clay County jail. The introductory information leading into each section are very well documented and easily understood. The introductions and footnotes blended seamlessly to make the documents more exciting. Really enjoyed this volume. Once again another beautiful volume in the series, appealing to scholar and general reader alike, as the general and volume editors continue to present the writings and documents relating to Joseph Smith, and his development of the vision of what he saw as his calling. A great volume to accompany any study of an extremely tumultuous period in the early history of the church and Joseph’s thinking at various points in its unfolding, as well as those of his close friends and associates. As one particularly interested in gaining greater insight into the lives of the early church members and how they were impacted by both the leadership of the church and its enemies, there is much here to lend to understanding the thinking that led to the movements of the saints and the response they received. Source notes and historical introduction are clear and concise and give great context to the transcripts. Especially enjoyed the many letters recorded here, always a greater personal insight to many of those connected to Joseph, including his wife Emma. Found the maps very helpful as well as the biographical directory. Insight as to how Joseph’s early revelations developed into church organization. This volume gave me far greater insight into a period in church history that is often told in the aggregate. This volume covers February 1838 to August 1839. As with the other volumes in this series, this book will serve as a wonderful reference for additional study related to Joseph Smith, Jr. and allow the reader to understand him to a level not previously possible. The source notes, historical introductions, and footnotes are thorough and allow for the reader to more fully understand each document that is presented. Often the notes are longer than the actual document being presented. Four of the above mentioned letters were written while Joseph was in Liberty (December 1, 1838, to April 6, 1839). I was invited in late August to take a look at the Documents, Volume 6 of The Joseph Smith Papers by the editors. I was particularly excited to review this volume due to the period it covered: February, 1838 to August, 1839. This is the period where the bulk of the Saints, including Joseph Smith, left Kirtland, Ohio, to Missouri and a relative peace in Caldwell County. Unfortunately for the Saints, this was only the beginning of a tumultuous year that ended with the infamous “Mormon War” of 1838, the imprisonment of Joseph Smith and several of his associates, the “extermination order” enacted by Governor Lilburn W. Boggs and the expulsion of the Latter-day Saints from Missouri in the dead of winter. It was a period of uncertainty, suspicion, fear, but also, hope. Throughout the events of this year, the Prophet Joseph was motivated by his faith in the Lord and the promise of Zion. This faith would be rewarded by the Saints being welcomed into Illinois and settling an area that would soon be known as Nauvoo. The lessons learned during this period were also quintessential for when the Saints ultimately left Illinois for the Salt Lake Valley less than ten years later. My experience with The Joseph Smith Papers up until this point had been primarily with the Journals and Histories volumes, which were laid out in a linear fashion. When I was going through Documents, I found it fascinating and found it interesting to read each individual document with its own historical context. Letters, minutes, revelations etc. are presented to the reader. The revelations presented here are known to many as being present in the Doctrine and Covenants, one of the canonical books of scripture used by The Church of Jesus Christ of Latter-day Saints. Many Mormon scholars will also know of the letters shared between Joseph Smith and his wife, Emma, while incarcerated at Liberty Jail in the winter of 1838-1839, but some of the more interesting documents include an 8 page dissertation by the Prophet Joseph listing the losses and damages incurred by the expulsion from Missouri, numerous discourses, and the famous epistle to the Church and Bishop Partridge sent through Emma. It is the same epistle mentioned of during the exodus from Missouri scene featured in Emma Smith: My Story. As you read it, you cannot help but get swept away in what Joseph and the others must have been experiencing while in custody, and like Paul almost 2000 years earlier, remained steadfast, talking about faith, religious freedom and that in the Lord’s time and in His way, He would set things right for the suffering Saints. It was a particular treat to read. The editors of Doucments, Volume 6 have done a great job presenting context for each document and presenting it from a balanced perspective. Looking at these events from a historical perspective, I was not disappointed in how it was presented. The editors gave me the good and the not so good. It cross-referenced other works that focused on this particular time in LDS Church History, both from outside and within the Church. The editors were not afraid to show a darker side of these events that most Latter-day Saints are familiar with, and did so in a way that allowed Mormon and non-Mormons alike to consider looking at their history from an objective point of view. As a devout Latter-day Saint and a convert later in life, I have always been fascinated by our history but never been afraid of it. The Documents, much like the Journals and Histories series, showcase that although called of God and magnified his calling as the Prophet of the Restoration, Joseph Smith was, first and foremost, a human being with more complexities than most are willing to give him, good or bad. There’s something for everybody in this volume. The Joseph Smith Papers project has been an ambitious undertaking, and it was truly a pleasure reviewing the contents of Documents, Volume 6. I highly recommend it for anybody who’s a collector of the volumes, for members of the Church looking to better understand what is meant when we say that Missouri was indeed ‘a refiner’s fire’, and especially recommend this read for any student of history or politics, looking to understand what the consequences are when you mix ideological purity with religious conviction. Given the tone of politics and current events in North America, it is fascinating to look back at our past and see the same events transpire years earlier, even if the people are different. We have the ability to learn from our past so that we do not repeat it. Looking at the Missouri events through individual snapshots of history (minutes, discourses, letters etc. ), you begin to understand the people who were there, what motivated them, what drove them, and then see their politics, history and faith from a different point of view. You may not agree, but you are left understanding them. This belongs on a bookshelf or tablet today. I highly suggest you go and get yours today. Excellent introduction and context for each documents. This volume covers the move from Ohio to Missiouri (1838 to 1839). The initial introduction to the volume provides an excellent overview of historical events leading up to this 1838. The authors/editors are candid and provide good detail to allow the reader to understand the context for each document. LDS and non LDS readers will appreciate the "Editorial Method" section in the beginning of the volume. It explains the documents used, the editorial process, and the efforts to preserve the documents as they were written by the authors. You will appreciate the time and detail that the authors/editors have taken to examine each document and its historical context. While the beginning introduction provides an excellent overview (the introduction sections of each volume of the JSPP would probably make a good introduction to church history), you can skip to any ahead to any document you want and the authors provide a good summary of what is happening in that period of time so that you can understand the context for each document. Very well done and highly recommended! This volume covers February 1838 through August 1839, which is a very important historical period in the Church. The timeline of Joseph Smith's life provides a detailed although easily understood historical context of events contained in this volume. The most interesting portion of this volume provides significant insight and documentation of the period Joseph spent in Jail in Missouri and the anguish and frustration of being jailed while the Church members were severely persecuted. Some of the most important revelations were received during this period of difficulty for Joseph and the Church. The continuing conflict with the State of Missouri and the expulsion of the saints from Missouri are critical to understanding the progress of the early Church. Joseph's leadership was in question and the manner in which he handled it is indicative of his Holy Calling as the Prophet of the Restoration. Historical introductions are provided to give the reader additional context in reviewing individual documents. Footnotes are detailed and also provide a wealth of information to the reader. The Geographical Directory, Maps, and Biographical Directory are worth reading just for their information alone. Overall, highly recommend adding this volume to your personal library. A Gold Mine of Information and Insight!!!!! The latest release of the Joseph Smith Papers continues the tradition of excellence that is a hallmark of the project. The documents, covering the period from February 1838- August 1839, chronicle the organization and operations of the Latter-Day Saints during a particularly difficult period in history. While the documents serve as invaluable first hand sources, it is the incorporation of background and context in the commentary on these sources that gives the reader insights into the information. I unhesitatingly recommend this volume as a wonderful addition to ones' personal library. By any measure the Prophet Joseph Smith was an exceptional man. He was called of the Lord to be His spokesman to reorganize His Church. When the Lord called Joseph Smith to be His Prophet He prepared him well to face opposition. The Lord did this by revelations through the Holy Spirit. Joseph learned he should not join any of the churches on earth. More importantly he learned he was going to become an instrument in the Lord's hand to establish the Gospel of Jesus Christ on earth once again.What followed for the people are spiritually remarkable revelations as being correct and true. Revelations to Joseph Smith and to those righteous brothers and sisters around him are plainly referenced to holy scripture comparable to the Bible throughout Volume 6 either b y the written word or electronically. These words are revelations written down by Joseph Smith given by Jesus Christ are for our spiritual development in good and sad times. Imprisoned by corrupt men and secular leaders, Joseph Smith's life was taken by violent people. The reader will find a fair and balance writing given to them in this volume by Church of Jesus Christ of Latter-day Saint scholars for our doctrine research in order to better our lives as part of our blessings given by the Lord Jesus Christ. As a lifelong member of the Community of Christ, I have found, 'The Joseph Smith Papers" project to be quite fascinating for a number of reasons. I would not call myself a student of church history, but I do own several books published as apart of this project. I find it fascinating the struggles the early members of the church and how things currently happening in the church. The church has been through a lot and I believe can learn from the early saints, because if we don't know where we've been we are bound to encounter some of the same issues. Some of the things I learned by reading this book, including how many of the early members packed up everything and followed church leaders to places like Kirtland, Far West, various parts of Missouri among many other places. In some cases, members of the first presidency were called to move to Far West and a short time later was advised they need to pack things up, move themselves and their families back to Kirtland because that's where they were needed. Other points of interest in this book included as Josep Smith was in prison in 1839 his thoughts and focus remain with the members of the church. Though in prison it seemed as if his heart was broken because he could not be with the church members as they faced conflict. One of the many topics of particular interest to me covered in this book is the designation of Missouri as the “Land of Zion” and Kirtland as a “Stake of Zion”. Over the years, I've been fortunate enough to visit both places. One summer I was fortunate enough to work at the Community of Christ in the history department as an intern. Part of my responsibility was to photograph certain church artifacts and scan photographs in the church position. It was an interesting summer that let me have a small glimpse into church history. Anyone that has any interest in church would be missing a mountain of information if they are not reading 'The Joseph Smith Papers' or connected to the website connected with the book. The Lord said, “I am able to do mine own work." (2 Nephi 27:21) Joseph Smith Papers Documents Volume 6 is proof that God can do His work through prophets. In this compelling read, you will transport yourself into Joseph’s darkest days: disloyalty of "bosom friends”; horrific persecutions from dissenters and non-Mormon settlers; the extermination order; incarceration in Liberty Jail; evacuation and relocation of thousands of saints; a swampy mosquito-infested settlement. This meticulously, well-organized book will expand your understanding of LDS history against the backdrop of American religious freedom. With 173 pages of reference material, you will never be lost or confused. •	Are you wondering when Joseph moved to Far West? Check the chronology chart. •	Trying to locate a significant location in church history? See Maps in the back of the book. •	Did you forget how many children Joseph and Emma had and lost? See the pedigree chart on page 611. •	Trying to identify or understand more about a historical figure? The Biographical Directory quickly brings you up to speed. •	Did you lose track of who’s who in church history? The at-a-glance Organizational Charts can set you straight. •	Curious about federal laws that governed issues relevant to the Saints at the time? Simply drop down to bottom of any page for continuous informative footnotes that run throughout the book. To top it all off, concise historical introductions precede all documents, putting everything into context. Simply put, this book is a treasure and a must-have for any student of Church history! Follow the unfathomable history of a simple, ordinary young man from New York -- a prophet -- as he seeks to establish the “centre place” of Zion on earth with seemingly all forces arrayed against him. It reads like the book of Exodus with Moses leading the children of Israel out of Egypt. Miraculous! How could someone lead ever-growing masses of people from city to city, state to state, even country to country? Joseph did it and this book explains how. Joseph proclaimed, "No unhallowed hand can stop the work from progressing.” This book brings life to how Joseph accomplished that vision. The closing pages capture key points recorded by Willard Richards of a discourse in which Joseph recounted the story of Jesus telling his apostles, “yet a little while & ye shall see me no more.” A poignant foreshadowing of the prophet’s own destiny as a martyr. The annals of history cry out for religious freedom both then and today, and this book captures a significant part of that history from the life of a modern-day prophet. 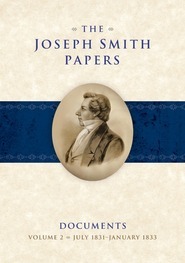 If you have not yet bought a book from the Joseph Smith Papers series, start now. Joseph declared, "no man knows my history,” but with modern technology and preservation, his restored history can and should be known. Read this book as you anxiously await forthcoming volumes to roll off The Church Historian’s Press and see the Lord do His work! This volume follows in the excellent tracks of the previous volumes. There are many things that could be said about the volume, but of particular note are the historical introductions, the detailed contents chart at the beginning of the book, insightful footnotes, and an impressive index. The historical introductions are full of interesting details about the background of each document. The language is simple and easy to understand for a non-professional such as myself. There is a detailed contents chart at the beginning of the book that makes it very user-friendly. This is not a book most people would want to read from cover to cover, and so the contents chart is very helpful for navigating the contents and honing in on what you might want to read. The index is also very thorough and very helpful. The footnotes are fantastic! They give all kinds of additional information that is worth taking the time to read. Overall, this is a wonderful volume and is worth owning. This is a wonderful addition to the writings of the Prophet Joseph Smith. This particular volume builds on the previous five volumes in the Documents Series. In Volume 6, you get a sense of quite a contrast in the prophet’s life, from the anticipation of the founding of Zion in Missouri and the experience of Liberty Jail, to the dealings of apostasy from his closest associates. I particularly enjoy the annotations and footnotes, which add a richness to the texts. The editors do a wonderful job in the introductions to each section in giving what not only is happening historically with the church, but the nation as a whole. I highly recommend Documents, Volume 6 for an in depth insight into the life and thought of the Prophet Joseph Smith. The editors of the Joseph Smith Papers Project, however, are doing just that – including it all – making publicly available every extant Joseph Smith document they can access. In this, the sixth volume of the “Documents” series in the Project, the authors present all known and available documents – 126 in all – created by Smith or by staff whose work he directed for the 19-month period February 1838 to August 1839. They provide unaltered and unabridged transcripts of letters, discourses, revelations, meeting minutes, resolutions, promissory notes, receipts, affidavits, and more. The historical introductions to each of the documents, together with editorial notes, footnotes, illustrations, maps, biographies, and index, provide a wealth of background and context to the documents themselves. Part 1: 15 February – 28 June 1838. The period opened on a hopeful note. Joseph Smith had received a revelation designating Missouri as “the land of Zion.” The town of Far West would become the main gathering place for the Saints. Plans were underway for the construction of a new temple there. The steady influx of newcomers mostly from the East and from British North America, however, caused great uneasiness among the Missourians already settled in this part of the state, most of whom were from the South. The conflicts that quickly ensued can be explained not only by opposition to the new religion, but also by the cultural differences that would divide the nation itself. Part 2: 8 July – 29 October 1838. Mormons seeking to settle in Jackson County, Missouri, in the earlier part of the decade had found they could count on neither state nor local government authorities to shield them from persecution. In the summer of 1838, Joseph Smith and other church leaders in the northwest counties of the state concluded they had only themselves to defend against mob violence. Latter-day Saint men organized a military group that came to be known as the Danites. When a crowd of angry men kept Mormons from voting in Gallatin, Daviess County, Danites on hand engaged them; men on both sides were injured. Conflicts between Missouri vigilantes and the Mormons escalated. Legal proceedings proved unfruitful in stemming the violence. Part 3: 4 November 1838 – 16 April 1839. Part 3 covers the time Joseph Smith was held in state custody. State civil and militia forces had been generally unwilling to quell October’s violence. Anti-Mormon vigilantes burned houses and ransacked homes; Danites did so, as well. In late October Missouri Governor Lilburn Boggs claimed that “the Mormons must be treated as enemies and must be exterminated or driven from the state” and issued an order to the state militia to do so. On October 30, 1838, an anti-Mormon vigilante force of about 200 men rode into the small Mormon settlement of Hawn’s Mill in Caldwell County where they shot and killed 17 men and boys. No vigilante was killed, and none were ever arrested for the murders. Joseph Smith and other church leaders were arrested at Far West for destruction and theft of property. They were brought before a circuit judge who had been appointed by Governor Boggs. The judge was the brother-in-law of a man who had been killed in a skirmish between Latter-day Saints and anti-Mormons in 1833, when Mormons were forced to leave Jackson County. The judge found probable cause that Smith and others had committed treason and committed them to jail to await trial. They spent the winter in the unheated Liberty, Missouri, jail, but never came to trial. The impoverished Saints were indeed driven from Missouri, as Boggs had ordered. As many as 10,000 walked in bitter cold and snow 200 miles to the east to Quincy, Illinois, across the Mississippi River. There they were given food, shelter, and employment. In April, apparently sympathetic guards allowed Smith and his fellow prisoners to escape. Part 4: 24 April – 12 August 1839. Part 4 of the Documents covers the 4-month period following the Saints’ expulsion from Missouri. One of the first items of business was the preparation of a formal expression of gratitude for the generosity of the people of Quincy in welcoming and aiding the refugees. Efforts were made to obtain redress for members’ losses in Missouri, without success. Church leaders who had arrived earlier in the year began arranging for the purchase of large tracts of land in Commerce, Illinois, to the north of Quincy, and in Montrose, Iowa Territory, across the Mississippi from Commerce. Members in Quincy and throughout the country were urged to move to Commerce; it would become the headquarters of the church. After receiving counsel from Smith on matters of doctrine and church administration, members of the Quorum of Twelve Apostles were called to preach the gospel in Europe and England. The Joseph Smith Papers, Documents, Volume 6 is a scholarly work. It is nearly 800 pages in length and has almost 3,000 footnotes. It has 176 pages of reference material plus meticulously researched source notes for each of the 126 documents and an exhaustive index. One might be tempted to describe it as a research volume to be found primarily on the shelves of the reference library. But the serious reader of Mormon history will find personal stories of love, hope, sorrow, tenderness, sadness, betrayal and unbridled evil, with a rich variety of characters, heroes and villains, who loved or hated the Mormon prophet and his fellow Saints. This book gets five stars. If you have the first five volumes or this is your first volume, you will enjoy the sixth volume. I most enjoyed reading the letters from Liberty jail that Orson Pratt pulled Doctrine and Covenants sections 121-123 from. There was a lot more background information including their failed attempt to escape Liberty jail and the court procedures. The true strength of the volume are the first-hand accounts from letters sent to and from church leaders to their families and the church leadership and the discourses of Joseph Smith. You will learn more about the motives of the Missourians and what led them to form mobs and evict the Mormons from Missouri. The maps and chronology of important events and the timelines of Joseph’s life and pedigree were well-done. The 55 page biography summaries helped put the events in more context. This sixth volume of the Documents series is a continuation of the impressive scholarly work done in the previous volumnes. This volume covers a very troubled time in the lives of the saints. It contains Joseph's letters, the revelations received during this time period, meeting minutes, financial documentation, legal actions. The volume presents the timeline of the saints begining at the establishment of Far West, Missouri as the center place of Zion. It covers how the saints expanded through northern Missouri. The imprisonment of Joseph at Clay County, Missouri. And how and when the saints were expelled from Missouri, the trials and experiences of their expulsion from Missouri and their arrival in Illinois and Iowa. My personal favorite documents are the discourses of Joseph, his teachings on the variety of subjects during this time that I've not seen documented elsewhere. Joseph had grown and matured as a leader of the saints, and as a prophet and servant of God. Church organization continued to grow as more members joined the church and more settlements were established, this included the institution of of stakes of the church, the formation of presidencies and local leaders in these settlements to provide direction and leadership for the members. There was much dissension and the apostasy in the church during this time. Some of these local leaders and presidencies were causes of the dissension and apostasy. His leadership was clearly re-established by direction from the Lord, and by the vote of the members during church conferences. The associated documents showing church organizational changes, establishing settlements, direction to form local leadership, dealing with dissension and apostasy, and re-establishing his overall leadership make it easy to see these events through Joseph's eyes. One of my least agreeable parts of this volume was the representation, the stance of the authors regarding the Missouri settlers and their treatment of the saints, the reasons for their actions and their motives toward the saints. I'm not one to give excuses or leeway to the Missouri residents, and the Missouri government leadership for the manner in which the saints were dealt with. The imprisonment of Joseph and others was treated thoroughly in the documents. The letters were of particular personal value to me, these shed additional light into the experience. Another favorite item is the instruction and teaching given to the Apostles. These teachings were formative to the doctrine of the church, offered clarity and purpose to the Apostles as they prepared for their missions, and in turn to the members. The end of this volume treats the saints arrival at Commerce, Illnois, soon to be Nauvoo. At a conference of the church in late summer of 1839 saw clear direction given through the prophet for this communities growth over the next several years. As with the previous volumes, there is so, so much to present. It is impressive how this group of authors, editors, and staff have diligently compiled this data for our use. Volume Six in the Documents Series of the Joseph Smith Papers contains documents from the period of Joseph Smith’s arrival in Missouri, the so-called “Mormon War,” and the expulsion of the Latter-day Saints from Missouri. This volume covers a crucial period in the history of Joseph Smith, climaxing with his months-long incarceration in Liberty Jail. It continues the high standard of excellence in the publishing of primary source documents exhibited in earlier volumes, not only of the series, but of the entire Joseph Smith Papers project. While the documents themselves are invaluable in understanding the events associated with Joseph Smith, perhaps the greatest strength of the volume is the inclusion of historical introductions, which provide much needed background and context for the reader. Each document includes an historical introduction and there are introductions for each of the four parts that the volume is divided into. In addition, there is a twenty-page volume introduction providing a readable overview of the period covered by the documents. Each introduction and document is fully annotated. The notes are refreshingly placed at the bottom of the page for ease of reference. These notes provide additional sources and explanations. Together with the reference material at the back of the volume, the reader’s curiosity can generally be satisfied, and if not, there is enough information to provide a catalyst for further individual research. Of particular interest, in Part 3, is the inclusion of five letters from Joseph Smith written in his own hand. These letters were written from Joseph to his wife Emma while he was in custody in Missouri. They offer insight into Joseph Smith the man, revealing his personality, his feelings for his family, his calling, the welfare of the Saints, and even concern for his dog. The reader can come close to “hearing” Joseph Smith and when compared to the letter from Emma to Joseph during the same period, his lack of formal education becomes vividly apparent. This volume is an intriguing and informative book that is well worth the time spent with it.